Granville Island is a famous tourist spot in Vancouver. There is a good public market with a lot of stores, music players and seagulls. An art school in the island adds an artistic atmosphere to this island. 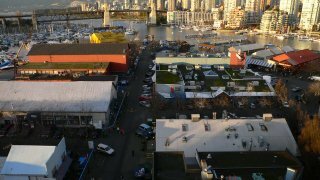 As it is located on the opposite side of my apartment over the False Creek, I sometimes visit there on my boat just for fun or for shopping. We can buy a fresh seafood at a reasonable price. I hear this island, though it is not exactly an island, used to be a warehouse town and was renovated into a tourist spot years ago. 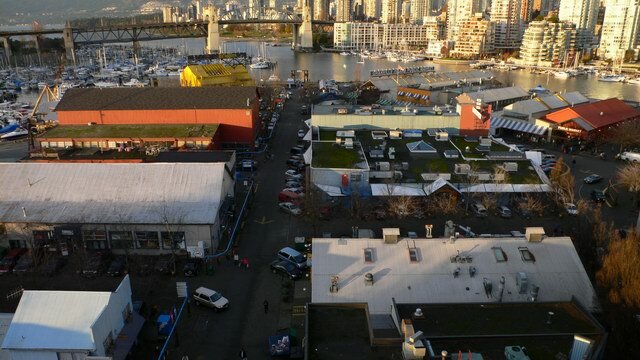 I think this renovation was a great success because I can't imagine Vancouver without Granville Island. When I walked over Granville Bridge a few days ago, I watched this island from above for the first time. Interestingly every building has the shape of a warehouse.